It started as a domestic dispute on the evening of Tuesday, May 2, 1950, in a home on East 111th Street, between San Pedro Street and Avalon Boulevard in South Los Angeles. But it quickly became more intense and dangerous when the husband, a 40-year-old ex-con from Oklahoma, picked up a .45-caliber handgun and began to threaten his wife and their two young children. Officer Roland E. White and his partner, Officer Leroy R. Bellew, went to the location, and found the man in a phone booth, in the back of the tavern. They approached the man and told him that they wanted him to go outside with them, where they wanted to talk to him. Initially, the man agreed. But as they were walking across the tavern toward the door, the man pulled out his gun. When White attempted to grab for the gun, the man started shooting, hitting White five times in the abdomen and hitting Bellew once in the leg. As the other patrons in the tavern scurried for cover, the bartender grabbed White's gun and shot at the man as he ran for toward the door, but didn't hit him. White was born Oct. 23, 1923, in Parsons, Kansas, the second of three children born to Gordon Ralph and Leona Valentine Yawman White. His older sister, Eva, was born in 1921, and his younger sister, Shirley, was born in 1926. Shortly after Shirley was born, the family moved to San Bernardino, California, where Gordon White died in 1928, at the age of 29. With three children all under the age of 10, Leona White moved to Ontario, California, where she found work in a factory. In 1931, Leona White married Truman Putnam. Six years later, she died, at the age of 32. After their mother's death, White and his sisters moved in with an aunt and uncle in Huntington Beach, California. After serving in the U.S. Navy during World War II, White moved to Los Angeles, and joined the LAPD on Oct. 16, 1947, two weeks before his 24th birthday. He married Los Angeles native Kathryn Alice Knowlin, and their only child, Roland E. White Jr., was born on Dec. 27, 1948. After the shooting in the tavern, Bellew was able to crawl back to the police car and radio for help. Bellew and White were both taken to the Georgia Street Receiving Hospital, while a massive police search with more than 100 officers was launched for the gunman. The next morning, M.C. Tedford, the owner of a service station at 10962 S. San Pedro St., received a visit at about 6 a.m. from a man he knew from the neighborhood. The man said he had been up all night, and asked for some coffee. Tedford noticed that the man was dirty, his clothes were torn, and he seemed jumpy, so Tedford asked him what had happened. The man told Tedford that he had shot two police officers the previous night, and he was looking for a place to hide. Tedford initially didn't believe the man's story, and assumed that he had been out drinking all night, so he offered to let the man stay in a storage shed behind the service station. But Tedford started to believe the story when he noticed the police cars pulling up, and officers getting out with their guns drawn. Tedford spoke with one of the officers, and described the man hiding in the storage shed. The officer said that was the man they were looking for. As officers gathered around the shed, the man came out, looked around and saw the officers, raised his pistol to his chest, and shot himself. The man's wife was called to the scene. He told her simply, "I did it," before he died while being transported to the Georgia Street Receiving Hospital. At the same hospital, Bellew recovered from the gunshot wound to his leg. But White, 26, died nine days later, on May 11, 1950, leaving a 19-year-old widow and a 16-month-old son. 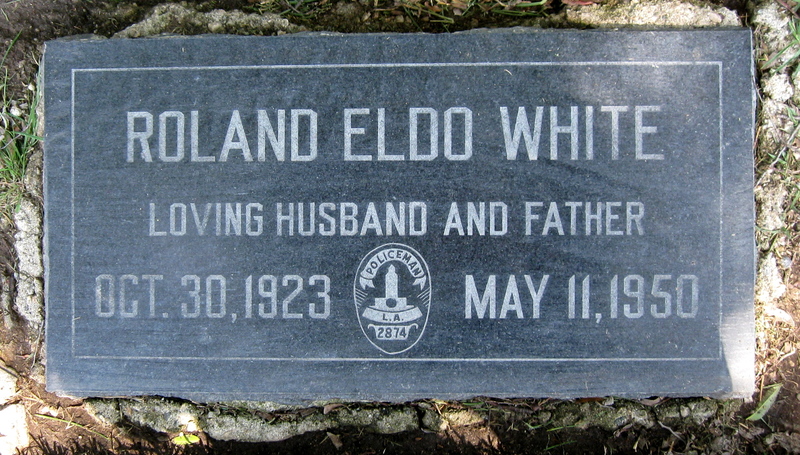 White was buried at Inglewood Park Cemetery. An estimated 300 police officers attended the funeral service. The procession was led by the Drill Team of the Los Angeles Police Post 381, American Legion, followed by 100 motorcycle officers, followed by other officers, family and friends. Officer White's sign, with his first name spelled incorrectly, is located on the west side of Avalon Boulevard, between East 109th and East 110th streets.